It is time to stop crying over spilt milk. The days of traditional enterprise, on premise-only deals with fat margins, are slowly disappearing and there is little sympathy forthcoming from technology vendors. The changes in the IT hardware infrastructure market have been with us for a few years. With the emergence of cloud computing on the impact on all facets of the IT ecosystem we will look at what each player is facing and provide some observations and guidance about how each player can gain advantage and remain relevant during these turbulent times. For the software aficionado’s, we will examine the software changes in the market in another article. Cloud infrastructure is growing rapidly but you still have time to plan a thoughtful and staged move from your traditional IT infrastructure to a new cloud model. 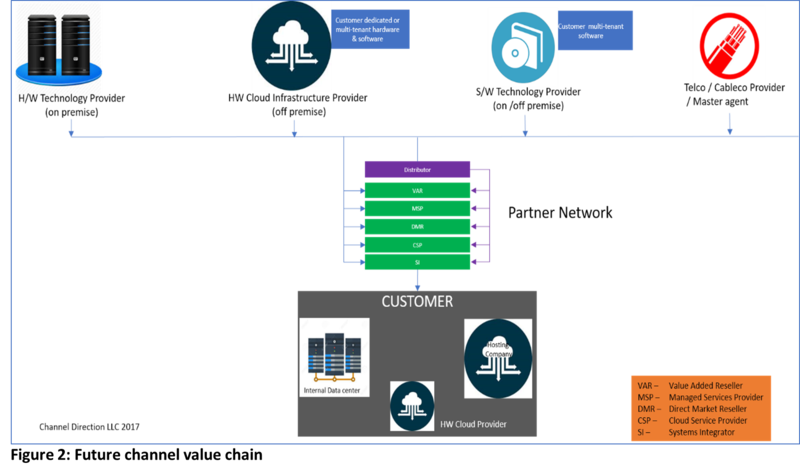 Traditional IT vendors are marketing a range of cloud and on-premise solutions (for the purposes of this article on-premise is defined as capital equipment owned by the customer in their data center or in hosted data center) through the indirect channel to meet changing IT buyer behaviors and it is time to either adjust to the changing market or do something else. 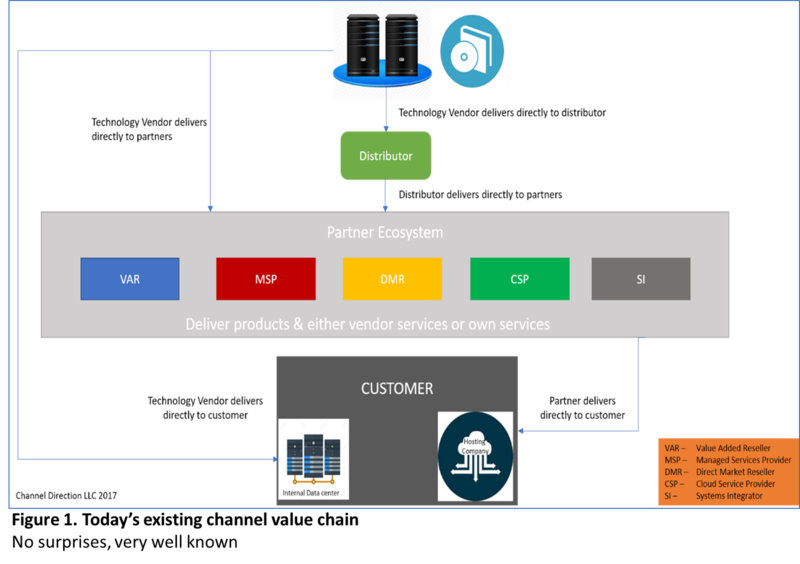 Vendors want to work with traditional partners that have engineered their business model to the new realities of the market and / or work with new “born-in-the-cloud” partners that can help increase and accelerate penetration of their cloud solutions to existing and new markets and customers. For end users, cloud offers more options for sourcing IT solutions with lower total cost of ownership, alternative technologies and delivery options, new vendors, and new approaches on how to improve and deliver IT to their internal and external customer base. As the procurement and origination of IT systems and applications shift to more involvement or outright ownership by the internal business units inside of corporations, the choices and decisions companies are making vary widely. But one thing is certain – the previous status quo has been turned on its ear. Vendors, distributors and breadth of resellers will need to react to these changes and approach the end-users differently. The customers are likely to demand more collaboration with the seller, greater understanding of the total cost of ownership, the return on investment metrics and what the seller can offer in terms of assisting with the adoption of the new systems and applications. While cloud is the news of the day, pricing for this alternative may not be a driving factor. In fact, it may be down the list a quite a bit. End users need to be acutely aware of the providers' SLA’s – performance, availability metrics, data security, data portability and quality. Poor quality and service are always unacceptable regardless of price. Further, switching costs should also be known up front. As companies of all sizes move more and more applications to the cloud, adjustments to how they set expectations and deliver services to the business will continue to morph. Let’s take a top-level look at the cloud market data provided by the analyst community. So, what do these numbers tell us? 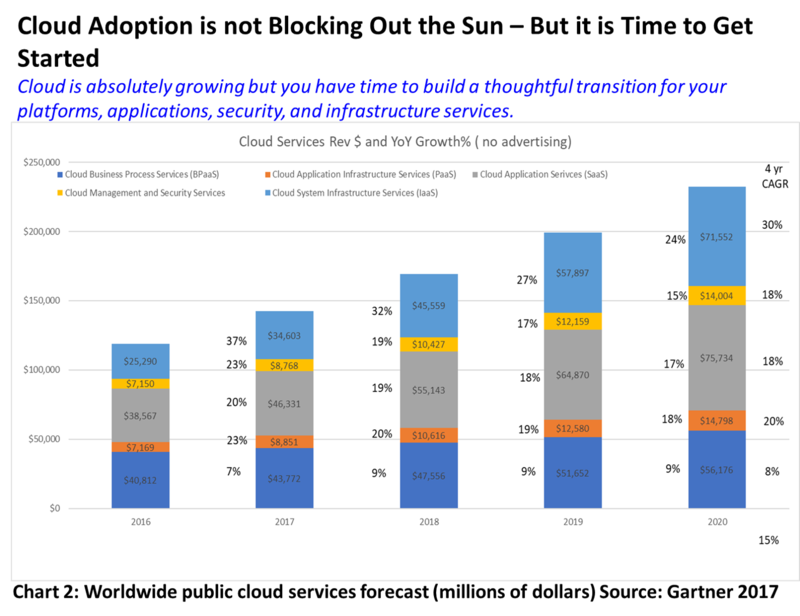 First, as we all know most of the forecasted growth is cloud spending for infrastructure and software. 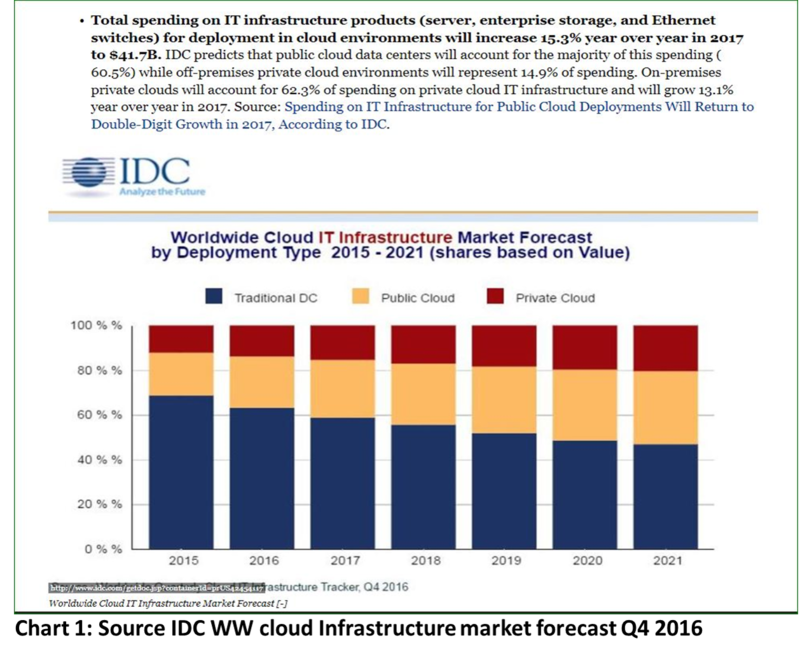 What we sometimes forget is that even at the end of the forecast period in 2020 the traditional data center spend is still about 43% of the total. 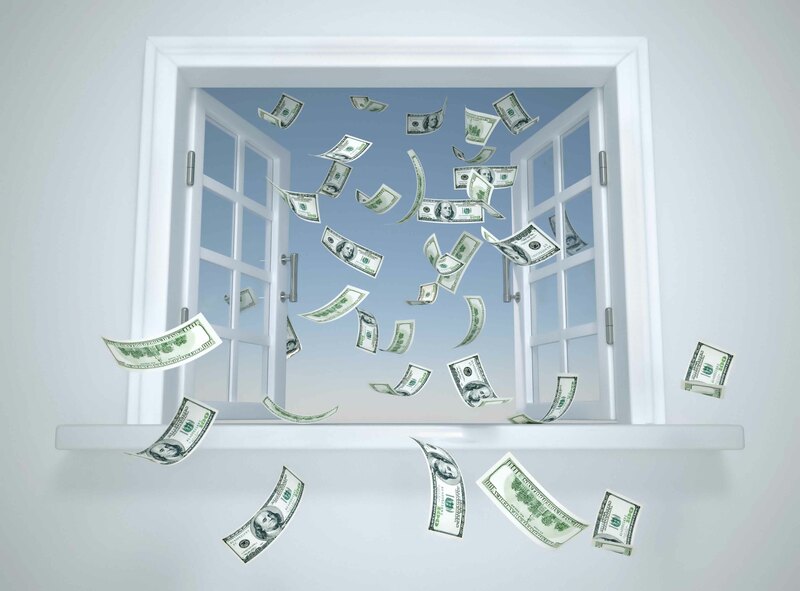 While we are not ones to whistle through the graveyard, for us it indicates that ~ 43% of the data center spend is still within the purview of on-premise providers. We certainly wouldn’t ignore the obvious movement to the cloud, but for all parties involved, having a hybrid strategy of growing the cloud business while still providing product and services to the on-premise clients seems to us to be a winning strategy. The world is not changing overnight but careful business modeling and changing steps will get partners in a position to succeed. 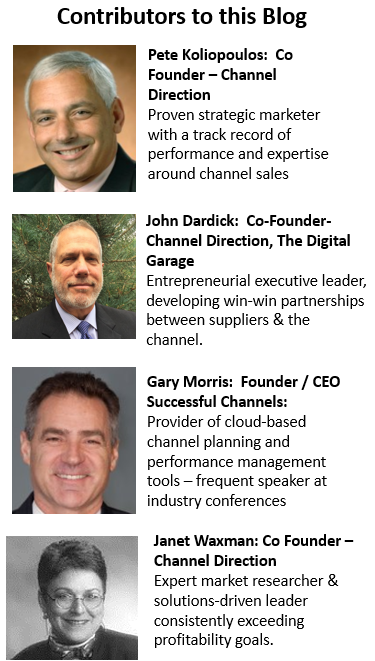 So, what does the traditional IT indirect channel need to accomplish to put themselves in a position to succeed and what should they expect from their vendors? Vendors that build new cloud delivery models and nurture both traditional and new cloud-focused channel models will win with partners and end customers. The vendors have a stubborn problem. For those in the hardware business, specifically infrastructure hardware, the old days are just that, old. Hyper-converged systems, reduced buying of big brands by mega-datacenter operators and reductions in market capitalization are all putting real downward pressure on the traditional, name brand, IT vendors. To keep shareholders happy, vendors have a few choices. They can grow through acquisition, be acquired (e.g. EMC / Dell), or they can align their resources to their new strategic direction (e.g. HP sale of software unit and IBM focus on software and services). They can also gain back some margin by moving partners out of distribution and serve them directly or they can sell direct to end-users. This helps profitability but may hurt their ability to scale and keep the distributors engaged. One thing the traditional infrastructure vendor can’t seem to accomplish is to gain presence into the mega-datacenters. This is a big problem as ODM's (original design manufacturer) and "unbranded white box" solutions are gaining share. (Does the customer care which brand as long as the provider is delivering to the customers' SLA expectations?) If the traditional vendors can’t penetrate the IaaS cloud vendors and the traditional vendors customers’ move applications to IaaS providers who are using equipment from the ODM manufacturers, then the brand-named suppliers of compute, storage and networking are in a bind! When commoditization and de facto standards level the playing field, customers benefit and name brand vendors suffer (see X86 and trends like SDN and SDS). The traditional infrastructure vendors themselves need to transform in order to survive, but they must also think about the larger ecosystem. Helping their partners to transform is a good start, but much more must be done. They need to re-productize their products and services for the digital economy, identify and execute strategic partnering and M&A activity, and enable their existing partners to better compete in the cloud marketplace. Innovation is the big neutralizer. Distributors must add more services to help partner customers and end customers succeed with traditional and cloud-based models to compete in the new IT delivery world. Distributors are facing a serious challenge to their long-standing value-added proposition to resellers as well as to their vendors. While many fundamental and historical distributor services don’t change, in the era of digital distribution others are no longer relevant. We could deep dive into many areas, but for the purposes of this article, distributors are focused on two avenues: innovation or aggregation. Innovation versus aggregation depends on your vantage point. Take for example the recent Avnet and Tech Data transaction. For Tech Data this was an aggregation play. Yes, it’s filled some holes in their global footprint, expanded their vendor portfolio, and it increased revenues and relevancy with key suppliers. For Avnet, the play was innovative; out with the old, in with the new. They are embracing the new economy and digital transformation. The sale of Avnet Technology Solutions (ATS) jettisoned the legacy model business and generated capital to invest in the future. The recent acquisition of Premier Farnell added engineering resources and supply chain services for their customer base. To further their innovation strategy Avnet acquired Hackster.io. CEO, Bill Amelio stated “During the quarter, we further enhanced our digital platform with the acquisition of Hackster.io, which provides over 200,000 makers a forum to learn how to design, create and program Internet-connected hardware. They strategically aligned their supply chain capabilities of the components business with engineering resources and innovators. Now this is not the only innovation in distribution. Look to Westcon's acquisition of Verecloud, developer of cloud services brokerage platform for the channel. Credit Westcon for the courage to acquire a technology platform to differentiate their services. ScanSource's acquisition of Master Agent Intelisys was another innovative move. Recognizing issues with traditional resellers adopting the recurring revenue model, they acquired a telco channel partner that possesses the experience, build processes and capability to sell and support services. All of this points out distributors must think and act differently moving forward or they will become less relevant to the IT market. The distributors will have to focus on services whether that is new services, or really hone and refine their skills with existing services like enablement, channel management, setting up marketplaces, new financing programs and possibly aggregated billing systems if they want to survive. Food for thought – Could US distributors sell direct to end users like their Non-US counterparts? Most successful IT partners have all the ingredients to succeed but need to model and update their business strategy for the new IT cloud-delivery world. Partners are not immune to the ongoing change to how customers are sourcing IT solutions. Many partners are unprepared for the shift to the cloud and a service based industry. Some had blinders on and disregarded the change, thinking it was not real or not going to impact them or their customer relationships. Now the cold hard reality is setting in, and vendors are not taking care of partners to the extent partners would like or as the vendors have historically done. End-user customer relationships and their associated spend are moving to cloud providers direct or to resellers that have embraced the digital economy. Those that do feel ignored or bypassed by vendors and are not proactively addressing the challenges to their business model are vulnerable and may not survive. This is a wakeup call; take responsibility for your company, your decisions, and actions. This is a whole new world; the digital economy, Technology as a Service (TaaS) is affecting all the entities in the IT channel ecosystem. Migration from product resale to services. Services may take many forms depending on the reseller appetite for innovation and investment. The profitability should improve as the partner adds services and moves up the value stack (staff augmentation, professional/engineering services, and managed services). 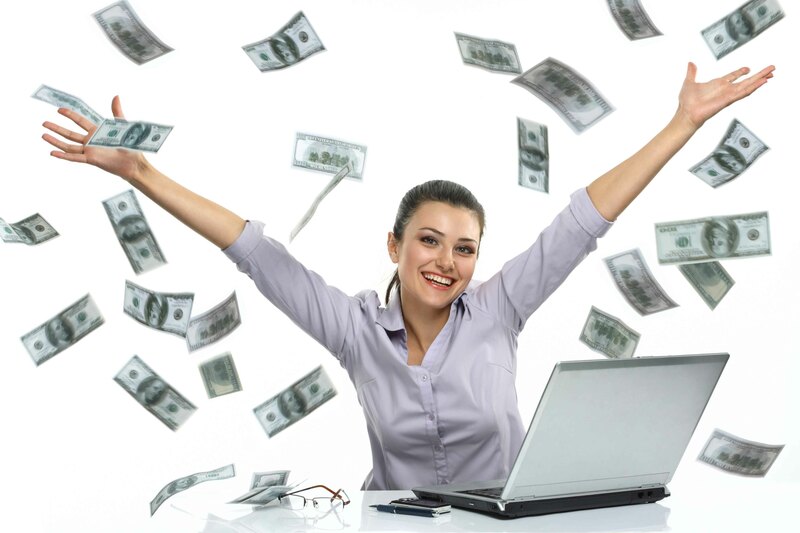 Profitability will also increase if the services are not vendor resell, but rather reseller built and delivered. Keep in mind that while services will increase profitability it will likely reduce top line revenues through the transition as the reseller reduces its dependency on product sales and transitions to a service based recurring revenues business model. New alliances or strategic partnerships with channel partners who are involved in delivering cloud services/solutions. This will expand reach, capabilities and accelerate speed to market. Build professional and/or managed services practice(s). Add engineering resources to develop your own IP, increase services expertise, add new capabilities, or increase capacity. Align with an ISV or an app developer to add more software to the portfolio or to build unique applications or capability. For resellers that want to continue to embrace the product sales model, they can increase revenue by adding new practices and product categories. Start reselling cloud services as a way to get in the game. These services will be a recurring revenue stream which will grow the top line, increase bottom line profitability, and provide greater value to your customers. This is also a solid first step leading to the sale of more professional services. Partners have always been very resourceful and innovative. As the customer’s needs change, so must the partners approach and their portfolios. Partners have lots of choices, let’s hope they choose the right ones. Food for thought – Could large resellers pivot to provide distributor-like services? End customers are moving to cloud-delivered software solutions but still need services and configuration support to realize the full value of the software they are using. In third place is Infrastructure-as-a-Service (IaaS) think AWS. Some will be surprised by those standings, but the distance between second and third is minor. Given these data points and what is happening in the IT business is compelling news. For some cloud providers, it is awesome and they wish it was growing faster. For traditional IT infrastructure companies, the tone is certainly less enthusiastic. In many cases they are seeing their revenues decline, value diminish, and market caps heading in the wrong direction. This means layoffs, reorganizations, leaner operations, changes in their go to market plans and less usage of the channel. At this point cloud providers should be interested in the channel for many of the traditional reasons (reach, enablement, engineering, billing) as well as new services such as assessments, design, implementation / integration, deployment, adoption and other services best delivered by the customer’s trusted advisor, the partner. So, this won’t be your daddy's channel. To gain the interest of cloud providers channel partners have to be heavily committed and invested into services, both vendor services and their own services. As the margins on the product side continue their decline the services will carry the load for these folks. Over the next five years we will see more change in the overall IT industry than we have in a long time. The industry has matured, prospered and now the structural changes that are happening are disrupting all aspects of the model we have known very well for many years. The true winners here will be the customers with more choices, value and simplicity. Make no mistake we will all have a lot of heartburn over the same period. Very good article and information. Would suggest for futures more conversation around workload placement and over modeling of transformation. White paper from Intel on this subject is a very good representation for this. Let me know will be happy to send it over. There are also a number of partners in the ECO system making this transition successfully but it is clearly a journey not a sprint.